Carcinoma of the sigmoid colon presenting in an inguinoscrotal hernia is uncommon. Many of the cases seen in literature were diagnosed only intraoperatively, as most of them had misleading presentations. We report a case of carcinoma of the sigmoid colon in an incarcerated inguinoscrotal hernia with imaging findings of 18F-FDG PET/CT along with a brief review of the literature. Although inguinal hernias and carcinomas of the colon are commonly seen conditions in elderly patients, carcinoma of the sigmoid colon presenting with an inguinoscrotal hernia is rare. The diagnosis is difficult to make on clinical basis alone and most often made intraoperatively. We present a patient diagnosed with carcinoma of the sigmoid colon in an incarcerated left inguinoscrotal hernia along with hepatic metastases. A 77-year-old man presented with a history of dyspepsia and altered bowel habits of 4 months. Physical examination revealed mild hepatomegaly and a left-sided irreducible inguinoscrotal hernia. Investigations revealed elevated carcinoembryonic antigen (CEA) levels (9.63 μg/L). Ultrasound of the abdomen and scrotum revealed mild hepatomegaly with multiple focal hypoechoic lesions in the liver and bowel loops in the left inguinoscrotal region. The patient underwent colonoscopy, but the scope could not be passed beyond the proximal sigmoid colon due to abrupt luminal occlusion at this level. Evaluation with 18F-fluorodeoxyglucose (18F-FDG) positron-emission tomography (PET)/computed tomography (CT) was done. CT of the abdomen revealed herniation of the descending colon and sigmoid loops into the left inguinoscrotal hernia [Figure 1], small pericolonic lymph nodes, and multiple hepatic metastases. Focal, irregular and asymmetric circumferential sigmoid colonic wall thickening was seen with adjacent fat stranding and gross luminal narrowing in the scrotal sac. PET showed increased 18F-FDG tracer uptake in the sigmoid colon loop within the left inguinoscrotal hernia, along with hypermetabolic pericolonic lymph nodes and hepatic metastases [Figure 2]. The patient was taken up for diagnostic laparoscopy, and intraoperative findings showed growth involving the sigmoid colon incarcerated in the scrotal sac. Multiple liver metastases and few mesenteric lymph nodes were also seen, and the malignancy was assigned the surgical stage of pT3pN2aM1a. An open sigmoid colectomy with liver metastasectomy that included partial resection of left hemiliver with sparing of segment IVA and excision of metastases in segment IV B and VI was performed. Histological examination of the excised specimen revealed adenocarcinoma of the sigmoid colon. Patient was given postoperative adjuvant chemotherapy using folinic acid, 5-fluorouracil, and oxaliplatin (FOLFOX) regimen. In asymptomatic patients, the presence of inguinal hernia is not associated with any increase in risk for colorectal malignancy and does not warrant screening procedures., A recent history of loss of weight, change in bowel habits, anemia, and bleeding in an elderly male with an inguinal hernia, should always be viewed with suspicion.,, If a previously reducible hernia becomes progressively enlarged or irreducible with symptoms of obstruction and/or incarceration, an underlying colonic neoplasm has to be ruled out.,, An incidental or unexpected malignancy discovered during surgery can be an unpleasant surprise to the surgeons, as they may need to modify or extend the surgery. Furthermore, any metastases found during surgery completely alter the intraoperative and postoperative management, hence, a thorough preoperative evaluation is needed in these cases. Complete clinical examination, CEA levels, colonoscopy and if possible, a biopsy should be performed. Radiological investigations such as ultrasound examination of the abdomen and scrotum may show the contents of the hernias, including bowel loops, but the evaluation of the extent of lesions and surroundings is limited. CT is helpful as it shows the bowel wall thickening, extent, and length of involvement, adjacent structures, and other synchronous lesions. Slater et al. have reported that preoperative abdominal CT scan has failed to diagnose the presence of an underlying sigmoid cancer in their case of left inguinoscrotal hernia. 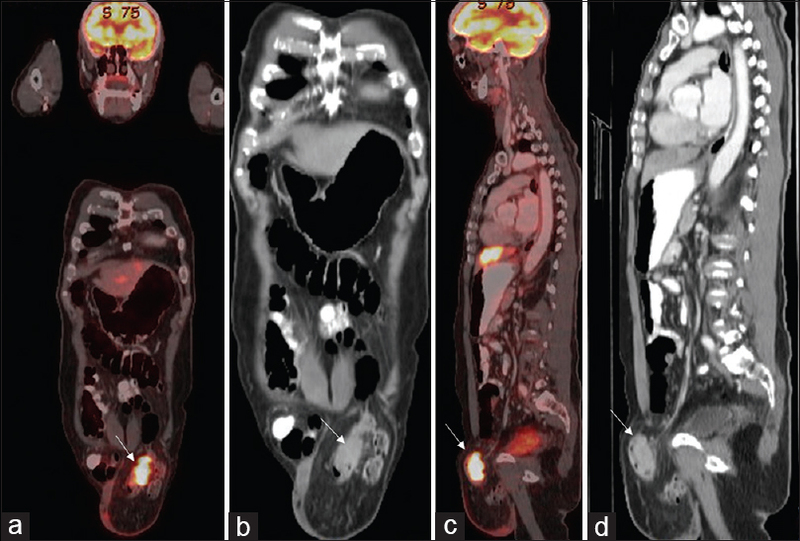 In cases with suspected bowel wall thickening and malignancy, a preoperative PET/CT may be more accurate than CT, as it can identify the metabolically active lesions. In most of the cases reviewed in the literature, the diagnosis of carcinoma of the sigmoid colon in an incarcerated inguinoscrotal hernia was made intraoperatively, but in our case, PET/CT was helpful in making a definitive preoperative diagnosis. Preoperative PET/CT in these cases is valuable in the detection and localization of primary lesion, lymph nodes, and distant metastases to plan a meticulous treatment strategy. PET/CT is also useful in staging the patient for appropriate postoperative management, including chemotherapy and radiation. Hence, we conclude that performing PET/CT imaging should be considered in the evaluation of inguinoscrotal hernias if an underlying malignancy is suspected. The authors certify that they have obtained all appropriate patient consent forms for images and other clinical information to be reported in the journal. The patient understands that his name and initials will not be published and due efforts will be made to conceal the identity, but anonymity cannot be guaranteed. Ko KH, Yu CY, Kao CC, Tsai SH, Huang GS, Chang WC. Perforated sigmoid colon cancer within an irreducible inguinal hernia: A case report. Korean J Radiol 2010;11:231-3. Slater R, Amatya U, Shorthouse AJ. Colonic carcinoma presenting as strangulated inguinal hernia: Report of two cases and review of the literature. Tech Coloproctol 2008;12:255-8. Available from: http://www.gco.iarc.fr/today/data/factsheets/cancers/10_8_9-Colorectum-fact-sheet.pdf. [Last accessed on 2018 Oct 16]. Chern TY, Tay YK, Perera DS. A rare case of ascending colon adenocarcinoma incarcerated in an inguinoscrotal hernia: Case report and literature review. Surg Case Rep 2018;4:48. Tan SP, Liau SS, Habeeb SM, O'riordan D. Synchronous colonic carcinomas presenting as an inguinoscrotal hernial mass: A case report. J Med Case Rep 2007;1:36. Falidas E, Gourgiotis S, Papachrysostomou M, Oikonomou C, Villias C. Sigmoid carcinoma localized in the sac of a right inguinoscrotal hernia. J Nat Sci Biol Med 2015;6:S150-2. Bali C, Tsironis A, Zikos N, Mouselimi M, Katsamakis N. An unusual case of a strangulated right inguinal hernia containing the sigmoid colon. Int J Surg Case Rep 2011;2:53-5. Boormans JL, Hesp WL, Teune TM, Plaisier PW. Carcinoma of the sigmoid presenting as a right inguinal hernia. Hernia 2006;10:93-6. Sakorafas GH, Peros G. Obstructing sigmoid cancer in a patient with a large, tender, non-reducible inguinal hernia: The obvious diagnosis is not always the correct one. Eur J Cancer Care (Engl) 2008;17:72-3. Sicklick JK, Weiss CR, Ahuja N. Image of the month. Incarcerated sigmoid volvulus in a right inguinal hernia. Arch Surg 2007;142:199-200. Avidan B, Bardan E, Lang A, Fidder HH, Chowers Y, Bar-Meir S, et al. Colorectal cancer screening in patients presenting with an inguinal hernia: Is it necessary? Gastrointest Endosc 2004;59:369-73.